Size, weight and technical difficulties limit the use of ponderous strip chart electroencephalographs (EEGs) for real time evaluation of brain wave function in modern intensive care units (ICUs). Portable, computer processed, bedside EEGs provide real time brain wave appraisal for some brain functions during therapeutic neuromuscular blockade when the visual clues of the cerebral function disappear. Critically ill ICU patients are frequently placed in suspended animation by neuromuscular blockade to improve hemodynamics in severe organ system failure. Using the portable bedside EEG monitor, several cerebral functions were monitored continuously during sedation of selected patients in our ICU. The processed EEG is able to continuously monitor the end result of some therapeutics at the neuronal level when natural artifacts are suppressed or eliminated by neuromuscular blockade. Computer processed EEG monitoring may be the only objective method of assessing and controlling sedation during therapeutic musculoskeletal paralysis. Aggressive methods of decreasing oxygen consumption, such as therapeutic musculoskeletal blockade, are used for patients with marginal oxygen delivery associated with cardiac and respiratory insufficiency. This is especially true during exotic mechanical ventilation methods designed to increase efficiency of oxygen utilization and decrease peak airway pressures. In addition, hemodynamic deterioration from the effects of unrestrained musculoskeletal hyperactivity can precipitate angina, heart failure, and cardiac arrhythmias by increasing myocardial work and oxygen consumption in the face of compromised coronary artery output . Escalating doses of sedatives followed by oppressive hemodynamic and ventilatory side-effects sometimes provide an indication for therapeutic musculoskeletal paralysis to rapidly get control of life threatening agitation syndromes. Brain wave monitoring by portable, non-invasive computer processed monitors allows quick recognition of some brain functions under titrated suspended animation in real time, facilitating modulation of therapy when the visual clues of neuronal function disappear. The classic EEG is usually recorded on a ponderous console with 8 to 32 channels to improve sensitivity. Difficulty using strip chart EEGs utilizing analog technology stimulated the development of electronically processed digital EEG monitoring. The processed EEG does not require as many head electrodes to generate a satisfactory signal that can be utilized for useful clinical data in the ICU. Current practice for digitally processed electroencephalography is to non-invasively place soft, moist contact electrodes across the forehead after skin preparation with an anti-oil solution. This procedure is quick and easy for the ICU staff to perform and requires no sophisticated training. The interpretation of an EEG tracing involves the quantification of signal strength and recognition of patterns . Quantification of the amplitude and frequency can be effectively accomplished with any signal monitor EEG. Pattern recognition, that of signal morphology, spatial and temporal distribution, and wave form reactivity is more difficult and is subject to observer interpretation. These parameters are not evaluated very effectively by raw signal EEG monitors, but some progress has been made using computerized processed signal EEGs. The electrical activity from eye movements, facial muscles, respiration, and the heart's electrical limits the effectiveness of bedside EEGs for routine use in the ICU, but under neuromuscular blockade, these artifacts are minimized and a relatively pure signal is obtained. Advantages of the processed EEG during neuromuscular blockade are that the data are more easily interpreted by physicians not specifically trained in electroencephalography. These trends may then be interpreted more quickly in the acute care setting, resulting in a faster clinical intervention where needed . The continuum from wakefulness to sleep involves a progressive decrease in the alpha band followed by increased activity in the beta, theta and delta bands. The alpha rhythm contains waves of 8-12 Hz and is very responsive to volitional mental activity, increasing with excitement and decreasing with tranquility. These rhythms occur mainly in the posterior head and are the predominant brain activity in the normal brain. The beta rhythm occurs in the prefrontal regions and has been associated with increased cognitive activity. Higher levels of beta activity have also been associated with anxiety and delirium . During the induction of general anesthesia, transient beta activity can also indicate the initial anxiolytic and amnestic stage of sedation. Both theta and delta waves are seen in stages three and four of normal sleep, and not in awake adults . In lower doses, narcotics in general tend to increase the amplitude of both alpha and beta frequency bands. Clinically, patients have reported their mood during these changes as associated with a sense of well being. In higher doses, theta and delta frequencies develop, heralding the onset of sedation. The effect on the EEG of intravenous fentanyl in doses of 30–70 μg/kg, following premedication with oral lorazepam 4–5 mg or 10 mg intramuscular morphine, was studied in cardiac surgery patients . 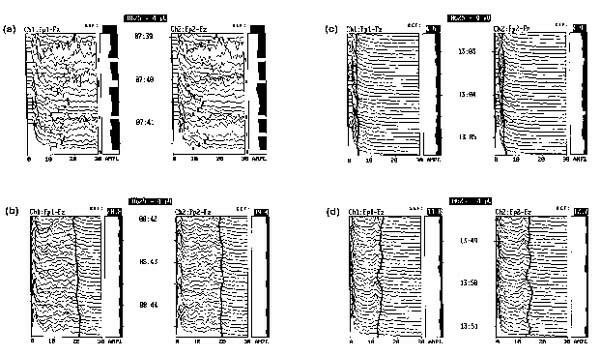 Within 1 min, the normal alpha rhythm was replaced by diffuse theta waves, followed quickly by predominant delta activity consistent with anesthesia. 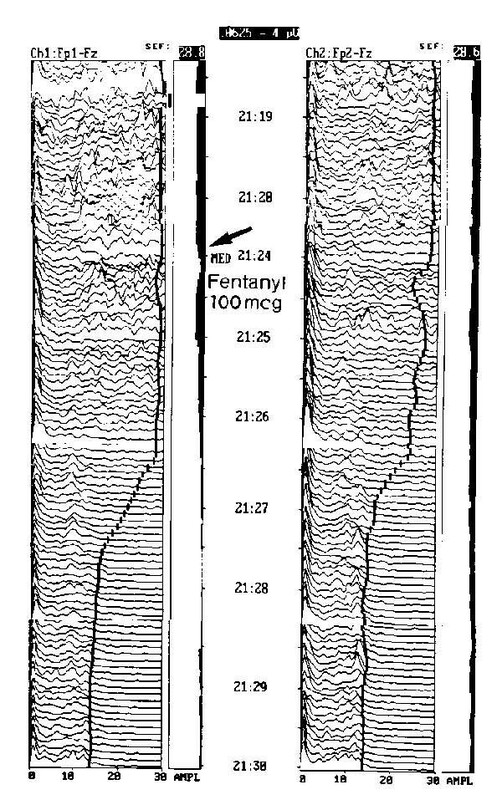 Lower doses of fentanyl resulted in slowed alpha activity with an increase in theta bands. In the cat, very high levels of fentanyl, in the range of 40–80 μg/kg produced seizure-like activity . 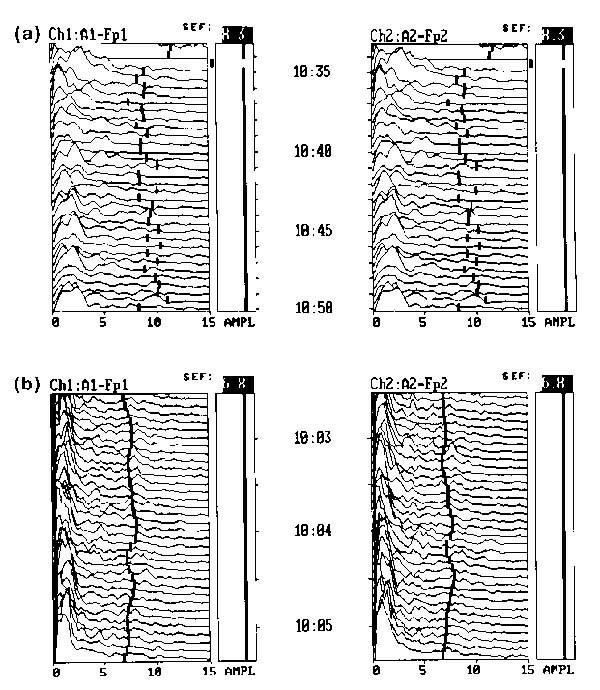 The EEG response after administration of morphine is similar to that of fentanyl, and resembles the pattern demonstrated by the centrally acting serotonin uptake inhibitors and alpha-2 agonists such as clonidine . 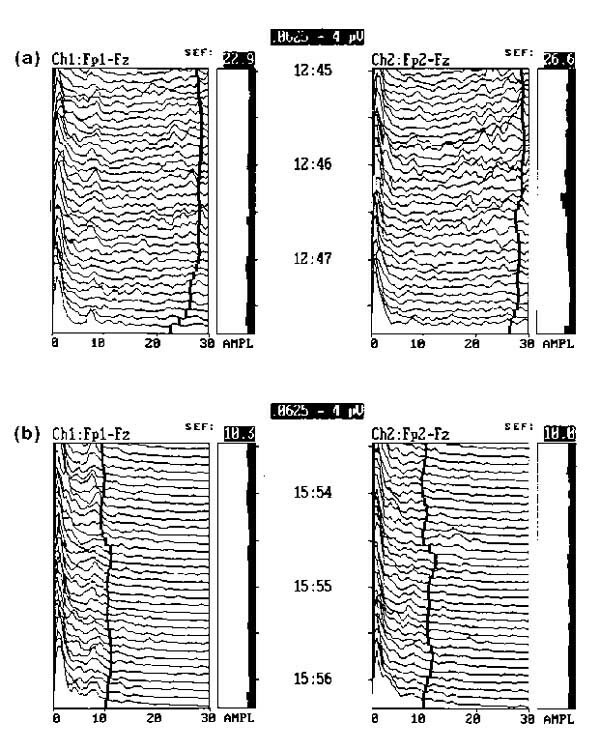 Administration of meperidine in usual analgesic intramuscular doses, produced a picture of alpha activity voltage reduction and the appearance of slow waves of intermediate voltage, consistent with mild hypnosis . In low doses, the anxiolytic action of benzodiazepines tends to decrease the percentage of alpha activity while increasing the prevalence of beta waves over 18 Hz . At high doses, theta and delta activity occurs, expressing the sedative activity of the drug. In one study of ICU patients receiving midazolam, alpha frequency decreased and beta activity became prominent. In higher doses, these changes disappeared to be replaced by delta/theta activity . The onset of action and recovery following intravenous administration of midazolam is rapid. When administered to counteract sedative effect, the benzodiazepine antagonist flumazinil quickly normalizes alpha wave activity . EEG effects were relatively slow in onset, reaching base-line over 30 min after infusion, and with a prolonged duration of action compared to diazepam. Increased activity in the 13–30 Hz range was prolonged, followed by increased sedative activity . 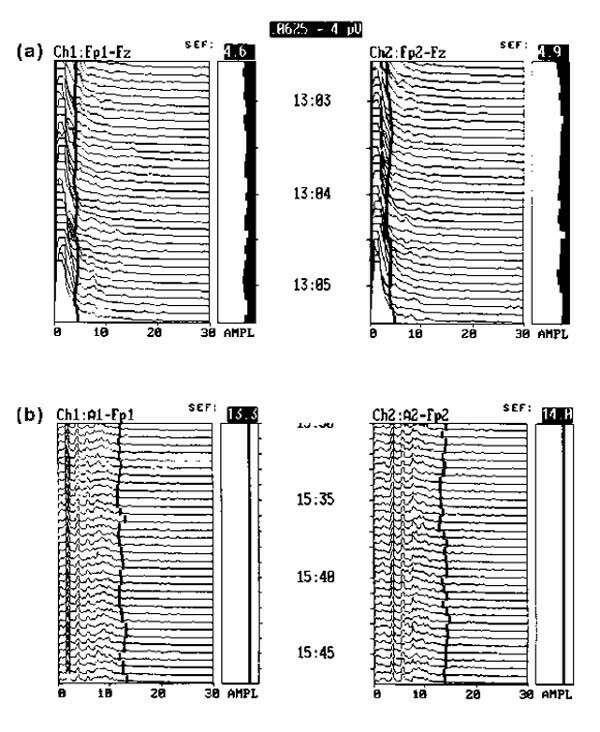 Administration of propofol for anesthesia initially produced an increase in the amplitude of the alpha rhythm, followed by an increase in delta and theta activity and burst suppression in some patients, consistent with anesthesia . There is a very rapid onset of action and recovery following intravenous administration of propofol. Intravenous administration of short acting barbiturates initially increases the amplitude of beta activity. Increasing doses of barbiturates can produce a pattern of coincider delta and beta activity . Large doses create a sedative pattern of delta/theta activity. An alpha-2 adrenoreceptor agonist is capable of potentiating narcotic actions. EEG effects of clonidine are similar to narcotics. The sedative action of the alpha-2 agonist clonidine is commonly appreciated in the ICU setting . The EEG response to clonidine is similar to that of morphine and thought to have a similar central mode of action . Clonidine increased the time rats spent in the drowsy stage of wakefulness, which corresponds to behavioral sedation and inhibited REM sleep for 6–9 h after administration . Hypocarbia causes slowing of the EEG. Small increases in pCO2 (5–20% above normal) cause decreased cerebral excitability and an increased electroshock seizure threshold. Higher levels (30% above normal) result in increased cerebral excitability and epileptiform discharges. High levels (50% above normal) produce EEG depression . 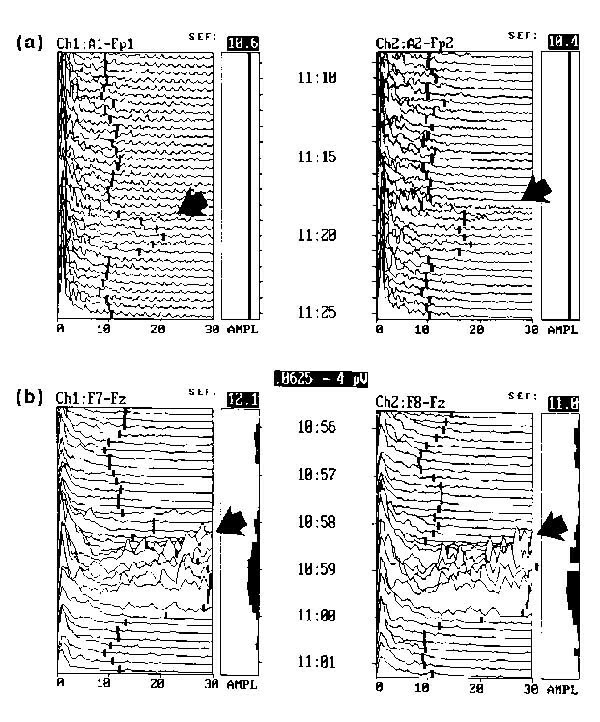 Hyperoxia causes a low amplitude, fast frequency EEG pattern characteristic of cerebral excitation . Decreased brain oxygenation initially causes increased cerebral excitability as a result of peripheral chemoreceptor stimulation and its attendant effects on the brain's reticular activating system . If hypoxia persists and overwhelms compensatory systems, diffuse EEG slowing occurs, eventually leading to EEG silence as anoxia approaches . Hypothermia causes progressive slowing of brain activity at core temperatures below 35°C. Complete electrical silence occurs with profound hypothermia (7–20°c) . In the awake patient, stimulation of the senses usually results in desynchronization of EEG patterns, increased amplitude and increased frequency . This increase in activity is directly correlated with increased brain metabolic activity. High amplitude delta waves can be associated with global cerebral dysfunction, indicating brain damage or potentially reversible metabolic suppression of cerebral function. EEG changes correlate well with blood flow to the cortex. EEG changes begin to occur when blood flow decreases below 30% of normal . However, neurologic outcome has not been demonstrated to be strictly dependent on EEG changes during periods of low flow, but more on duration of flow deficits . The therapeutic use of musculoskeletal paralysis with non-depolarizing paralytic agents has increased largely because of the advent of exotic mechanical ventilation modes that require subjugation of the patient's normal ventilation activity . During such ventilation modes, paralysis may benefit ventilation efficacy by decreasing chest wall muscle tension and peak airway pressure. In addition, the disparate inhalation and exhalation timing necessary for these modes is difficult for the patient to tolerate, and paralysis is necessary to avoid the patient fighting against this unequal inhalation: exhalation (I:E) ratio. Other uses for therapeutic musculoskeletal paralysis such as `chemical restraint' to protect health care personnel from violent behavior , and the decreasing of cerebral blood flow during unstable intracranial pressure following head injury , are relatively rare. Agitation episodes that threaten hemodynaimc stability are becoming more common in the ICU as a larger range of sick patients are identified are cared for. Life threatening agitation is usually signalled by escalating musculoskeletal hyperactivity in the face of increasing sedative administration. Eventually a point is reached where the direct effects of agitation combined with suppressive side-effects of pharmacologic agents threaten respiratory and hemodynamic stability. Agitated delirium syndromes, such as ethanol withdrawal, may constitute genuine medical emergencies as they have potentially disastrous hemodynamic and metabolic consequences and may become an indication for therapeutic musculoskeletal paralysis . Severe agitation syndromes such as delirium tremens alter physiology and can precipitate hemodynamic deterioration by increasing musculoskeletal activity and metabolic activity to the point where increasing cardiac output cannot be sustained by cardiac physiology . This can precipitate angina, heart failure, and cardiac arrhythmias by increasing myocardial work and oxygen consumption in the face of a compromised coronary artery output . In addition, musculoskeletal hyperactivity produces metabolic acidosis that can precipitate arrhythmias and compromise oxygen delivery. Hyperactivity in muscle groups not used to increased work can cause myoglobinuria and renal failure as well . If agitation resists the titrated effects of rapid-acting, short-duration sedatives and becomes so severe that hemodynamic stability is threatened, therapeutic musculoskeletal paralysis, endotracheal intubation and mechanical ventilation, and titrated hemodynamic support may be necessary to prevent cardiorespiratory collapse. True `suspended animation' can be induced to gain complete control of the situation early, rather than chance the increased hazards of partial control in unstable circumstances. Unlike benzodiazepines that cause musculoskeletal relaxation, non-depolarizing, neuromuscular, end plate neurotransmission antagonists affect therapeutic musculoskeletal paralysis. Suspended animation using musculoskeletal paralytic agents will effectively stop the effects of muscular hyperactivity on end organs. It is also extremely important to remember that underneath therapeutic paralysis lies unprotected cerebral function. Therefore, the amount of sedation needed to ameliorate the helpless feeling of paralysis in the awake state is virtually impossible to determine from any information gained by a physical examination or an objective sedation scale such as the Ramsay Score . For the intensivist, advantages of the computer processed EEG are that the data are more easily interpreted by physicians not specifically trained in electroencephalography . This technology uses a single bipolar lead to accentuate trends in brain wave activity (mostly frontal cortex), which may then be interpreted more quickly in the acute care setting, resulting in a faster clinical intervention where needed. Sophistication in bedside EEG hardware is increasing, with multi-channel EEG recording, various data reduction functions such as the Bispectral Index, and evoked potential analysis becoming available to the ICU. Modern cerebral function monitors survey brain electrical activity in real time and reflect changes in brain activity caused by sedatives and other therapeutics . There is accumulating evidence that regimens utilizing continuous infusion of sedative agents can be effectively titrated, assuring patient comfort and neuronal stability under paralysis, while the search for underlying pathology and effective treatment programs follows [35,36]. Different classifications and combinations of sedatives, analgesics or antipsychotics can be tried until the combination that brings about the most appropriately calm cerebral function tracing is discovered. Modern miniaturized electroencephalographic monitors (Fig 1) can be positioned at the bedside, visible to the clinical team but out of the way of nursing procedures. They are attached to the patient's frontal cranium by non-invasive patches similar to electrocardiogram (EKG) leads. The EEG monitor depicts gross brain wave activity in an easily interpretable fashion, allowing quick recognition of sedation adequacy during therapeutic neuromuscular blockade when the visual clues disappear. Some objective measurement of cerebral function can be frequently and rapidly assessed before the patient undergoes therapeutic obtundation, or specifically neuromuscular blockade, then the effects of sedation can be followed in real time (Figs 2 and 3). The effects of specific sedatives such as midazolam (Figs 4 and 5), lorazepam (Fig 6), and fentanyl (Fig 7) can be assessed in real time. 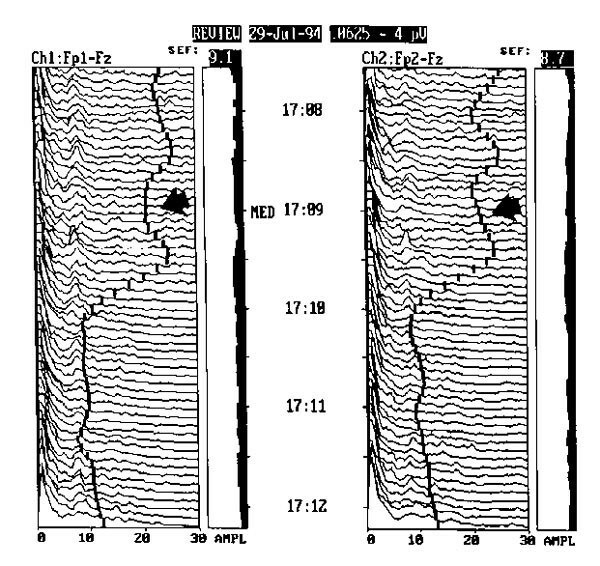 The effect of extremely deep sedation differs from clinical brain death by the presence of delta waves and the absence of EKG artifacts (Fig 8). A sedated patient undergoing neuromuscular blockade who is vigorously stimulated shows a brief `waking' pattern, demonstrating the sensitivity of monitoring cerebral responsiveness when the visual clues are not present (Fig 9). Adequacy of sedation can be titrated in real time, reflecting relatively small changes in therapy, such as inadvertent oversedation, on brain function (Fig 10). Once a patient with compromised respiratory or vital functions is placed on life support hardware, sophisticated monitoring devices such as continuous pulse oximetry, continuous mixed venous oximetry, and capnography effectively monitor hemodynamic and ventilatory parameters. However, for patients with intrinsic or iatrogenically initiated brain failure, it is exceedingly difficult to monitor the combined effects of delirium and oppressive sedation regimens on neuronal function once visual clues are removed. Musculoskeletal paralysis does not attenuate the effects of catecholamine release. In the past, sedation has been titrated under paralysis until tachycardia and hypertension normalize, suggesting that patient comfort has been achieved. This is an inaccurate way of determining patient comfort under the effects of paralysis, and may be unreliable in ICU patients on medications like beta adrenergic antagonists to control heart rate, and sympathomimetic drugs such as dopamine or dobutamine to support hemodynamics. The advent of cerebral function monitoring has improved on this old method dramatically. The processed EEG is potentially valuable in the ICU because of its ability to continuously monitor the end result of therapeutics at the neuronal level, improving the timing of therapeutic intervention by physicians not timing of therapeutic intervention by physicians not trained in the interpretation of standard analog strip EEGs. The most persistent argument against cerebral function monitoring in the ICU is the issue of cost versus benefit. Cerebral function monitoring as an accurate method of assessing and controlling sedation during therapeutic musculoskeletal paralysis seems desirable, but there are virtually no data yet demonstrating that such monitoring significantly alters patient outcome. There are those who require `hard' data supporting any therapeutic modality before they will embrace it. This is as it should be. However, this argument assumes the ready availability of convincing, substantive evidence supporting an improved outcome with the use of the test modality. When a modality resides on the frontier of medical practice and there are no hard data available, it seems logical to look for convincing data other than those which are necessarily outcome related as justification. Perhaps the assurance that the patient is comfortable under sedation regimens instituted when visual clues of neuronal function disappear is a substantive enough argument until hard data from future research projects come along. In deciding how much we can afford to monitor, we must also consider what we cannot afford not to monitor. Massive overdoses from multiple sedatives, analgesics, and even musculoskeletal paralytic agents are a real possibility when regimens have no objective guidance. Conversely, skimpy sedation regimens, arbitrarily instituted from a lack of the same objective guidelines, may cause lasting psychiatric complications in patients paralyzed and awake at the same time. Real damage to patients resulting from therapeutic misadventures during periods when cerebral function monitoring is not assessed are not only possible, they are likely. The risk to the patient from non-invasive cerebral functioning is non-existent and the potential benefits at least theoretically possible. The relatively small purchase price for one monitor spreads out quickly if the monitor can be used for numerous patients in an ICU setting. It seems likely that the protection and preservation of man's most valuable organ is entirely justified . 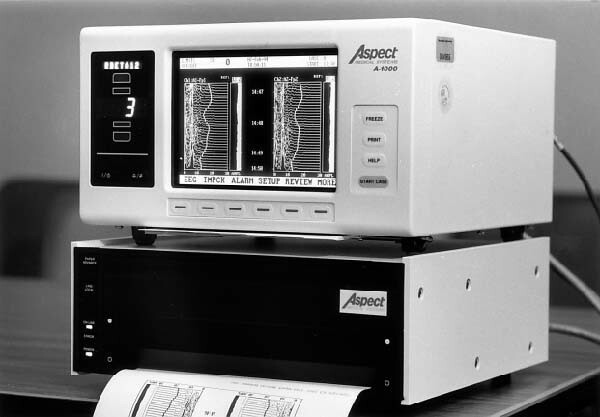 The ASPECT A1000®, a typical brain wave monitor capable of real time bedside EEG. (a) Cerebral electrical activity in a healthy volunteer, sitting in a quiet environment reading a magazine. Activity at normal sensitivity under 13 Hz to the left of the trend line. (b) A patient mildly sedated with lorazepam. The `monotony of sedation' pattern is illustrated. The spectral edge frequency (95% of brain wave activity occurring to the left of this line) demonstrates less variation between epochs. (a) Cerebral function tracing of an ICU patient who is alert, oriented, and aware but stimulated and anxious due to the frenetic ICU environment. There is progressively increased activity in the beta (> 13 Hz) ranges. (b) The same patient sedated with a continuous infusion of 2 mg/h midazolam. Narcotics and benzodiazepines in sedative doses generally induce a gradual reduction in activity at higher alpha (8-13 Hz) and beta (> 13 Hz) frequencies and increased activity at lower frequencies, especially theta (4-8 Hz) and delta (<4 Hz). The `activity line' shifts symmetrically to the left. Effect of midazolam as an intravenous sedative. This anxious patient was administered 2 mg intravenous midazolam during continuous EEG monitoring. The frequency diminished quickly in about 2 min, demonstrating the rapid clinical action of the short acting sedative. The action of propofol is similar to midazolam. 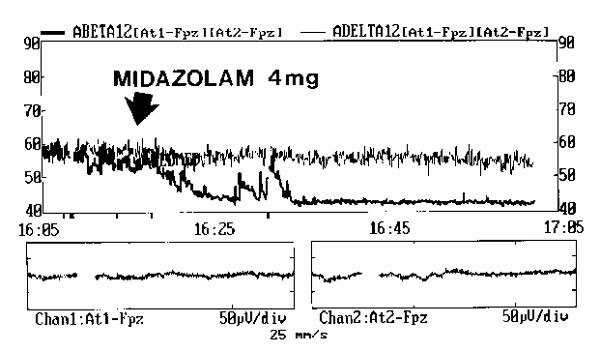 The effects of midazolam administration observed in a trend mode. Midazolam (4 mg) was administered in a bolus to an anxious patient at the arrow. Low frequency delta activity (thin line) shows a slow progressive increase. High frequency beta activity (thick line) decreases quickly and remains low. Effect of lorazepam as an intravenous sedative. 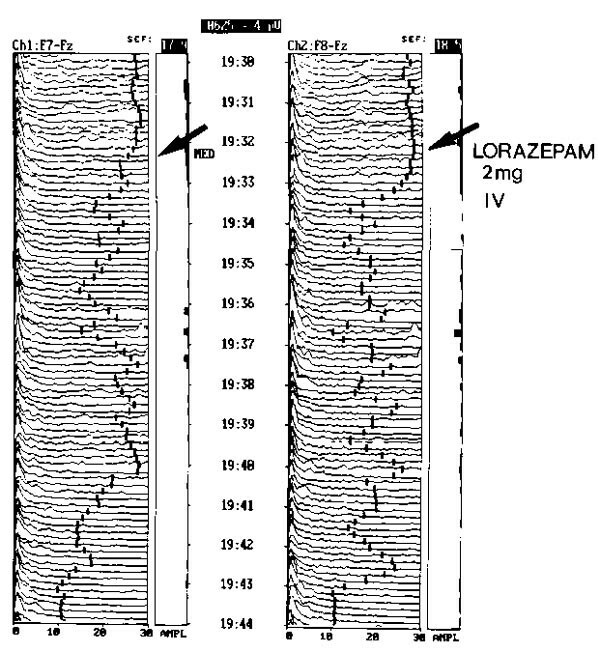 This anxious patient was administered 2 mg intravenous lorazepam during continuous EEG monitoring. The frequency diminished slowly in about 12 min, demonstrating the prolonged clinical action of the longer acting sedative. Effect of fentanyl as an intravenous analgesic sedative. This anxious patient with postoperative pain was administered 100 mg intravenous fentanyl during continuous EEG monitoring. The frequency quickly diminished in about 3 min, demonstrating the rapid clinical action of the short-acting analgesic sedative. Severe CNS depression produces increased amplitude in the delta band (<4 Hz) and very reduced activity in the other frequencies. (a) This patient with extremely toxic levels of ethyl alcohol was completely unresponsive on total life support, including mechanical ventilation. (b) The EEG tracing of a patient with certified brain death, established by EEG and clinical criteria. The activity line shifts to the right from electrical activity of the heart picked up by the monitor in the absence of brain electrical activity. EEG assessment of cerebral responsiveness during therapeutic neuromuscular blockade, and absence of potential artifacts from face muscle activity and eye blink. (a) Brief increase in higher frequencies normally associated with increased cognitive activity indicates cerebral response to a painful somatic stimuli. (b) Cerebral response to endotracheal suctioning in a therapeutically paralyzed patient. Dramatically increased high frequency waves, possibly indicating discomfort. (a) Patient with severe delirium tremens and life threatening agitation demonstrating multiple musculoskeletal artifacts on the EEG. (b) Neuromuscular blockade instituted with vecuronium and sedated with a bolus of propofol, followed by continuous infusion. (c) Patient oversedated on continuous infusion of propofol at 5 mg/kg/h. (d) Propofol infusion decreased to 2 mg/kg/h, brain wave activity increases.